Cavite (Filipino: Lalawigan ng Kabite; [ˈkabite]; Chabacano: Provincia de Cavite) is a province in the Philippines located on the southern shores of Manila Bay in the Calabarzon region on Luzon island. Situated just 21 kilometers (13 mi) south of the capital, it is one of the most industrialized and fastest growing provinces because of its close proximity to Metro Manila. With a population of 3,678,301 in 2015, it is the most populated province in the country. For over 300 years, the province played an important role in both the country's colonial past and eventual fight for independence, earning it the title "Historical Capital of the Philippines". It became the cradle of the Philippine Revolution, which led to the renouncement of Spanish colonial control, finally culminating in the Philippine Declaration of Independence on June 12, 1898 in Kawit, Cavite. 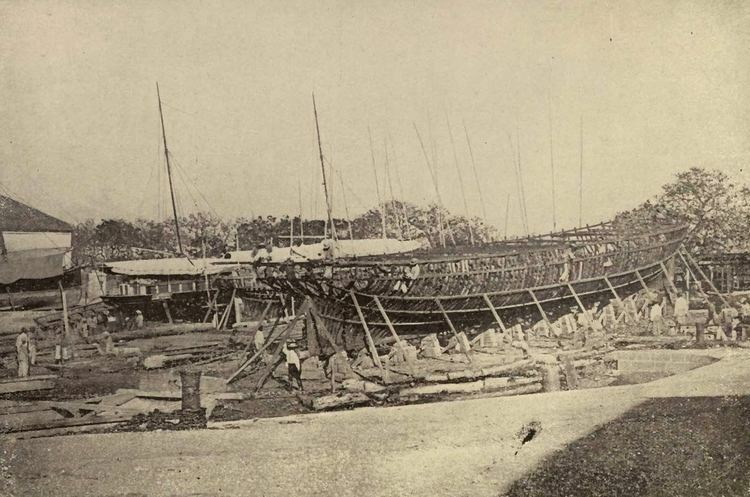 The old provincial capital, Cavite City also hosted docks for the Manila galleon, becoming an essential part of commerce between Asia and the New World. Cavite is surrounded by Laguna province to the east, Metro Manila to the northeast, and Batangas province to the south. To the west lies the West Philippine Sea. It is located within the Greater Manila Area, not to be confused with adjacent Metro Manila, the defined capital region. Cavite is the second smallest province (with the Province of Rizal being the smallest) in the Calabarzon region. Cavite occupies land area of 1,427.06 square kilometres (550.99 sq mi) which is approximately 8.72 percent of Calabarzon's total land area, 2.74 percent of the regional area and 0.48 per cent of the total land area of the Philippines. The municipalities of Maragondon and Silang have the biggest land areas, comprising 165.49 square kilometres (63.90 sq mi) and 156.41 square kilometres (60.39 sq mi) respectively, while the municipality of Noveleta has the smallest land area as indicated by 5.41 square kilometres (2.09 sq mi) or 0.38 percent of the provincial total and area. Situated at the entrance of Manila Bay, Cavite is characterized by rolling hinterlands punctuated by hills; shoreline fronting Manila Bay at sea level; and rugged portion at the boundary with Batangas where the Dos Picos mountains are located. The province has two mountain ranges. Cavite is divided into four physiographical areas, namely: the lowest lowland area, lowland area, the central hilly area and the upland mountainous area. The lowest lowland area is the coastal plain in particular. These areas have extremely low ground level of 0 to 2 metres (0.0 to 6.6 ft) elevation compared to the high tide level of about 0.8 meters (2 ft 7 in) from the mean sea level (msl). These are the cities of Cavite, Bacoor and the municipalities of Kawit, Noveleta, Rosario, northern part of Carmona and eastern part of Ternate. The lowland area consists of the coastal and alluvial plains. These areas have flat ground slope of less than 0.5% and low ground elevation of 2 to 30 metres (6 ft 7 in to 98 ft 5 in). The alluvial plain can be found in the city of Imus and southern part of General Trias. Into these municipalities forms the transition area between the coastal plain and the central hilly area. It also covers some areas of Bacoor, Kawit, Noveleta, Rosario, Tanza and Carmona. The third topography type is the central hilly area, generally found on the mountain foot slope. It forms the rolling tuffaceous plateau. This topography includes steep hills, ridges and elevated inland valley. The plateau is characterized with ground elevation ranging from 30 meters (98 ft) to nearly 400 meters (1,300 ft). Its ground slope ranges from 0.5 to 2%. The city of Trece Martires and Dasmariñas and the municipalities of General Emilio Aguinaldo, General Mariano Alvarez, Indang, Maragondon, Ternate, Silang and Carmona have this kind of topography. The last topography type is upland mountainous area, found in Magallanes, Amadeo, Tagaytay, Mendez, Alfonso, southern part of Maragondon and Carmona. They are situated at a very high elevation above 400 meters (1,300 ft) with slopes of more than 2%. The Tagaytay ridge has an average elevation of 610 metres (2,000 ft) with Mount Sungay (now People's Park in the Sky) at 14°8′31.71″N 121°1′19.02″E, the highest elevation in the province at 716 metres (2,349 ft). The mountain was much higher before with an elevation of 752 meters (2,467 ft), topped by rock formations that resembled horns (Sungay in Tagalog) hence the name. The prominence of the mountain was leveled in half during the construction of Peoples Park in the Sky during the Marcos administration. Cavite's land resources are categorized into two: forest lands and alienable and disposable lands. Forest lands are being maintained as they play a great role for the ecological balance of the province aside from the fact that they are home to numerous flora and fauna that needs to be protected and preserved. Correspondingly, the alienable and disposable lands are the built-up areas as well as production areas. These lands are intended for urban, economic and demographic developments. Cavite province lies in the western monsoon forest zone. This location is very beneficial for the formation of tropical rainforests, which are characteristically made through natural vegetation. In 2007, the existing forest area within the province totaled only to 8,625 hectares (21,310 acres). These forest areas were categorized as Protected Landscape under the National Integrated Protected Area System (NIPAS) and the rest, unclassified forest (Non-NIPAS). A total of 4,000 hectares (9,900 acres) are located within the Mounts Palay-Palay–Mataas-na-Gulod Protected Landscape, a protected area in Ternate and Maragondon created by Proclamation Number 1594 on October 26, 1976. The park lies at the border of Cavite and Batangas and encompasses three peaks, Palay-Palay, Pico de Loro and Mataas na Gulod. The five (5) unclassified forests are found along Tagaytay Ridge, Maragondon, Magallanes, Ternate and Alfonso. The other mountain peaks in the province are Mt. Buntis, Mt. Nagpatong, Mt. Hulog and Mt. Gonzales (Mt. Sungay). Cavite's forest provides an abundance of different forest products. Bamboo, a member of the grass family, is one of the most available forest products found in the municipalities of Ternate, Magallanes, Maragondon and General Aguinaldo throughout the year. These lands are being used in various ways, either for agriculture, residences, open areas, etc. Based on the Cavite Provincial Physical Framework Plan 2005–2010, Cavite's alienable and disposable lands are further classified into production lands and built-up areas. Production lands in Cavite are intended for agriculture, fishery and mining. On the other hand, built-up areas are mainly for residential areas, commercial, industrial and tourism areas. Majority of production land-use is for agriculture. Considering that 50.33% of the total provincial land area is engaged into agriculture, it can be generalized that in spite of rapid urbanization in the province, Cavite remains to have an agricultural economy that makes food security attainable. Some of the major crops being produced in the province are rice, corn, coffee, coconuts, cut flowers and vegetables. Included in the agricultural land use are livestock farms that range from piggery, poultry, goat and cattle farms. The climatic suitability of Cavite makes the province ideal for integrated farming, having crops and livestock raising in one farm. Fishery is also another major component of the agricultural sector. Having rich marine resources and long coastlines, the province is home to numerous fishery activities providing livelihood to many Caviteños. In some lowland and even upland areas, fishery, in the form of fish ponds are also producing a large amount of fish products. 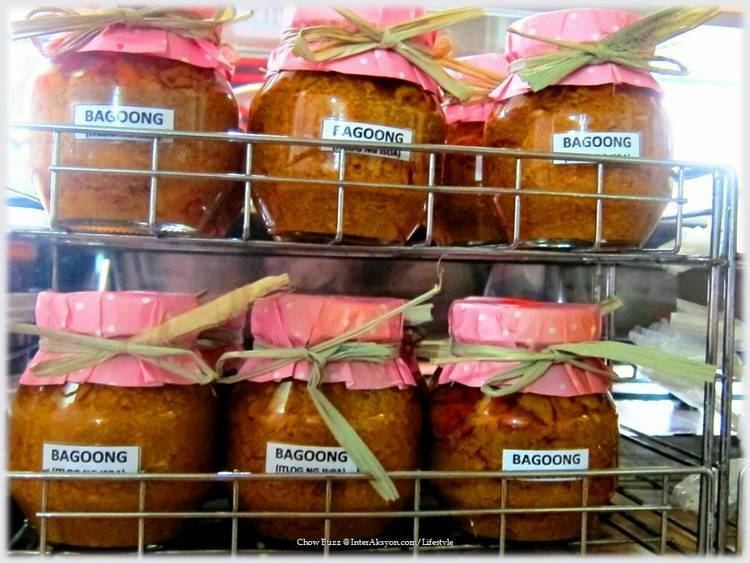 Some areas in Cavite are also engaged in fish processing and production of fish products like fish sauce. Mining is the third component of production land-use in the province. As of 2009, there are 15 mining and quarrying areas operating in Cavite. Extraction includes filling materials, gravel, and sand. The built-up areas are mainly composed of residential and industrial sites. This also includes commercial and business areas where commerce is transpiring. According to the 2007 Census of Population and Housing by the National Statistics Office of the Philippines, there are 611,450 occupied housing units in Cavite. Moreover, according to the Housing and Land-Use Regulatory Board, there are around 1,224 housing subdivisions with issued license to sell in the province until 2009 which occupies an area of 9,471 hectares. Meanwhile, the industrial sector also develops rapidly in the province. For 2009, operational industrial estates cover around 2,939 hectares (7,260 acres). Tourism establishments are also considered built-up areas such as golf courses, leisure farms, resorts and the likes. The hydrological network of the province is composed of seven major rivers and its tributaries. These river systems generally flows from the highlands of Tagaytay and Maragondon to Manila Bay. Numerous springs, waterfalls and rivers found in the upland areas of the province, have been developed for tourism. In the lowland areas, hundreds of artesian wells and deep wells provide water supply for both residential and irrigation purposes. Cavite shoreline stretches about 123 kilometres (76 mi). The communities located along the coast are Cavite City, Bacoor, Kawit, Noveleta, Rosario, Tanza, Naic, Maragondon, and Ternate. The richness of Cavite's coastal resources is a major producer of oysters and mussels. The fishing industry also produces shrimp and bangus (milkfish). The western coastline are lined with of pale gray sand beaches popular with tourists. Thus, fishery and tourism contributes to the economic activity of the province. Cavite is composed of several soil types according to soil surveys conducted by the Bureau of Soils and Water Management (BSWM). Classification of soil types in a specific area is a very important consideration in identifying its most fitted land-use. This way, utmost productivity can be achieved. The lowland area of Cavite is generally composed of Guadalupe clay and clay loam. It is characterized as coarse and granular when dry but sticky and plastic when wet. Its substratum is solid volcanic tuff. These types of soils are suited to lowland rice and corn while those in the upland are suited for orchard and pasture. Guadalupe clay adobes are abundant in the southern part of Bacoor and Imus bordering Dasmariñas. The soil is hard and compact and difficult to cultivate that makes it generally unsuitable for diverse cropping. It is very sticky when wet and granular when dry. Forage grass is advised for this type of soil. Hydrosol and Obando sand are found along Bacoor Bay. The shoreline of Rosario, Tanza, Naic and Ternate are lined with Guadalupe sand. The central area principally consists of Magallanes loam with streaks of Magallanes clay loam of sandy texture. This is recommended for diversified farming such as the cultivation of upland rice, corn, sugarcane, vegetables, coconut, coffee, mangoes and other fruit trees. The steep phase should be forested or planted to rootcrops. The eastern side of Cavite consists of Carmona clay loam with streaks of Carmona clay loam steep phase and Carmona sandy clay loam. This type of soil is granular with tuffaceaous material and concretions. It is hard and compact when dry, sticky and plastic when wet. This type of soil is planted to rice with irrigation or sugarcane without irrigation. Fruit trees such as mango, avocado and citrus are also grown in this type of soil. Guingua fine sandy loam is found along the lower part of Malabon and Alang-ilang River at Noveleta. The type of soils that dominate the upland areas are Tagaytay loam and Tagaytay sandy loam with mountain soil undifferentiated found on the south-eastern side bordering Laguna province. Also on the southern tip are Magallanes clay and Mountain soil undifferentiated with interlacing of Magallanes clay loam steep phase. 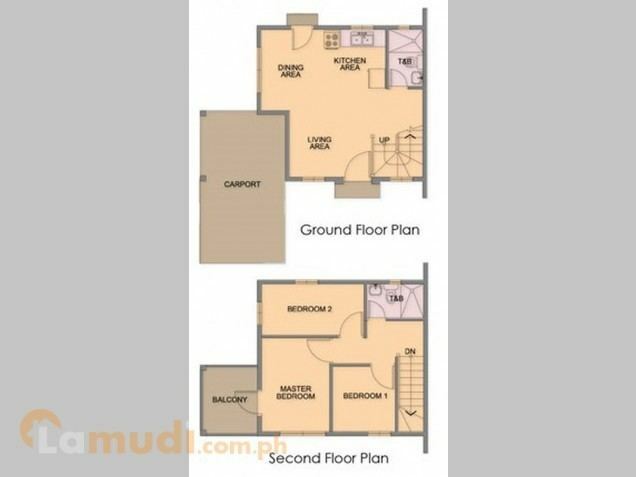 The Tagaytay loam contains fine sandy materials, moderately friable, and easy to work on when moist. In an undisturbed condition, it bakes and becomes hard when dry. About one-half of this soil type is devoted to upland rice and upland crops. On the other hand, Tagaytay sandy loam is friable and granular with considerable amount of volcanic sand and underlain by adobe clay. Mountain soil undifferentiated is forested with bamboos found in the sea coast. Cavite also has the Patungan sand characterized by pale gray to almost white sand with substratum of marine conglomerates which are found at Sta. Mercedes in Maragondon and in some coastlines of Ternate. The greater parts of Cavite are composed of volcanic materials, tuff, cinders, basalt, breccias, agglomerate and interbeddings of shales, and sandstones. The dormant and active volcanoes (Taal) are within these volcanic areas and have been the sources of volcanic materials which form the Tagaytay Cuesta. The drainage systems are deeply entrenched in the tuffs, eroding thin interbedded sandstones and conglomerate rocks which are the sources of little reserves of sand and gravel in the larger stream. Adobe stone quarries also flourish in the tuff areas. Cavite coastal areas have marl and conglomerate sedimentary rocks and some igneous rocks which are prominent in the high, mountainous regions of western part of the province. Black sands are found in Kawit while Noveleta has its own salt products. Magallanes has gravel deposits while reserves of sand and gravel materials are found in Alfonso, Carmona, Gen. Emilio Aguinaldo, Naic, Ternate, Maragondon and Silang. Cavite belongs to Type 1 climate based on the Climate Map of the Philippines by the Philippine Atmospheric, Geophysical and Astronomical Services Administration (PAGASA). Being a Type 1, Cavite has two pronounced seasons – the dry season, which usually begins in November and ends in April, and the rainy season, which starts in May and ends in October. The Köppen Climate Classification sub-type for this climate is "Am" (Tropical Monsoon Climate). The name "Cavite" comes from the Hispanicized form of kawit or it may be a corruption of kalawit, Tagalog words for "hook", in reference to the small hook-shaped peninsula jutting out to Manila Bay. The name originally applied to the peninsula, Cavite La Punta (now Cavite City) and the adjacent lowland coastal area of Cavite Viejo (now Kawit). Another theory proposes that the name is a Hispanicized form of kabit, Tagalog for "joined", "connected", or "attached", referring to the peninsula's topographical relation to the mainland. Edmund Roberts, in his 1821 memoir, stated that the "natives" called it Caveit due to the "crooked point of land extending into the sea." The present Cavite City was once a mooring place for Chinese junks trading that came to trade with the settlements around Manila Bay. The land was formerly known as "Tangway". Archeological evidence in coastal areas show prehistorical settlements. According to local folklore, the earliest settlers of Cavite came from Sulu or Borneo. The Spanish colonizers who arrived in the late 16th century saw the unusual tongue of land jutting out on Manila Bay and saw its deep waters as the main staging ground where they could launch their bulky galleons. It would later become the most important port linking the colony to the outside world through the Manila-Acapulco Galleon trade. In 1571, Spanish colonizers established the port and City of Cavite and fortified the settlement as a first line of defense for the city of Manila. Galleons were built and fitted at the port and many Chinese merchants settled in the communities of Bacoor and Kawit, opposite the Spanish city to trade silks, porcelain and other oriental goods. "A defensive curtained wall was constructed the length of Cavite's western side," beginning from the entrance, "La Estanzuela", and continuing to the end of the peninsula, "Punta de Rivera", with the eastern shore unprotected by a wall. Cavite contained government offices, churches, mission buildings, Spanish homes, Fort San Felipe and the Rivera de Cavite shipyard. Docks were in place to construct galleons and galleys, but without a dry dock, ships were repaired by careening along the beach. Fort San Felipe, La Fuerza de San Felipe, was built between 1609 and 1616. This quadrilateral structure of curtained walls, with bastions at the corners, contained 20 cannons facing the seashore. Three infantry companies, 180 men each, plus 220 Pampangan infantry, garrisoned the fort. The galleons Espiritu Santo and San Miguel, plus six galleys were constructed between 1606 and 1616. From 1729 to 1739, "the main purpose of the Cavite shipyard was the construction and outfitting of the galleons for the Manila to Acapulco trade run." The vibrant mix of traders, Spanish seamen from Spain and its Latin-American colonies as well as local residents gave rise to the use of pidgin Spanish called Chabacano. In 1614, the politico-military jurisdiction of Cavite was established. As with many other provinces organized during the Spanish colonial era, Cavite City, the name of the capital, was applied to the whole province, Cavite. The province covered all the present territory except for the town of Maragondon, which used to belong to the Corregimiento of Mariveles. Maragondon was ceded to Cavite in 1754 when Bataan province was created from Pampanga province. Within Maragondon is a settlement established in 1660 by Christian exiles brought in by the Jesuits from Ternate in the Maluku Islands, and named this land Ternate after their former homeland. Owing to its military importance, Cavite had been attacked by foreigners in their quest to conquer Manila and the Philippines. The Dutch made a surprise attack on the city in 1647, pounding the port incessantly, but were repulsed. In 1672, the British occupied the port during their two-year control in the Philippines. In the 17th century, encomiendas (Spanish Royal land grants) were given in Cavite and Maragondon to Spanish conquistadores and their families. The religious orders began acquiring these lands, with some donated, enlarging vast haciendas (estates) in Cavite during the 18th and 19th century, enriching themselves. 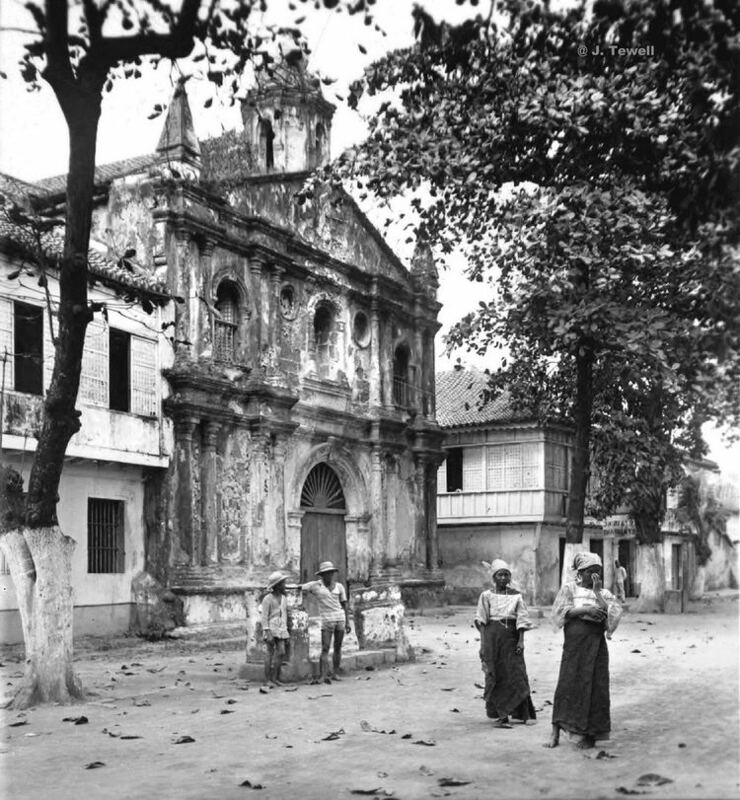 These haciendas became the source of bitter conflicts between the friar orders and Filipino farmers and pushed a number of Caviteños to live as outlaws. This opposition to the friar orders was an important factor that drove many Cavite residents to support reform, and later, independence. In 1872, Filipinos launched their revolt against Spain. Three Filipino priests—Jose Burgos, Mariano Gomez and Jacinto Zamora—were implicated in the Cavite mutiny when 200 Filipinos staged a rebellion within Spanish garrisons. On August 28, 1896, when the revolution against Spain broke out, Cavite became a bloody theater of war. Led by Emilio Aguinaldo, Caviteños made lightning raids on Spanish headquarters, and soon liberated the entire province through the Battle of Alapan. Aguinaldo commanded the Revolution to its successful end - the proclamation of the First Republic of the Philippines on June 12, 1898 in Kawit. During the Spanish–American War, American forces attacked the Spanish squadron in Cavite. The Spanish defeat marked the end of Spanish rule in the country. A captured Spanish cannon from the Cavite arsenal now sits in Village Green Park in Winnetka, Illinois, USA. In 1942, the Japanese Imperial forces entered Cavite, which was long the site of a major US naval base serving the United States Asiatic Fleet. The military built of founding general headquarters of the Philippine Commonwealth Army was active in January 3, 1942 to June 30, 1946 and the 4th Constabulary Regiment of the Philippine Constabulary was active again on October 28, 1944 to June 30, 1946 and stationed in Cavite during the military conflicts and engagements against the Japanese Occupation. From May 7, 1942 to August 15, 1945, Filipino soldiers of the 4th, 42nd, 43rd, 45th and 46th Infantry Division of the Philippine Commonwealth Army repeatedly entered the provinces in Cavite with the recognized guerrillas of the Cavite Guerrilla Forces and the Filipino-American Cavite Guerrilla Forces (FACGF) under Colonel Mariano Castañeda of the Philippine Constabulary to attack the occupying Japanese troops as the Filipinos attempted to recapture Cavite. After the initial conflict insurgencies persisted in Cavite in 1944 supported by local Filipino troops of the Philippine Commonwealth Army units and Caviteňo resistance. Before the liberation in Cavite in 1945 by joint U.S. and Filipino soldiers and aiding the Caviteño resistance groups was liberated the clearing province and defeats Japanese. In January 1, to August 15, 1945, combined Filipino and American troops along with the Caviteño guerrilla fighters liberated in Cavite from the Japanese forces begins the Battle for the Liberation of Cavite at the end of World War II. Cavite had a total population of 3,678,301 in the 2015 census, making it the most populous (if independent cities are excluded from Cebu), and the second most densely populated province in the country. The tremendous increase can be observed in the year 1990 when industrialization was introduced in the province. Investors established their businesses in different industrial estates that magnetized people to migrate to Cavite due to job opportunities the province offers. Another factor attributed to the increase of population is the mushrooming of housing subdivisions. Since Cavite is proximate to Metro Manila, people working in the metropolitan area choose to live in the province together with their families. Natural increase also contributes to the increase in population. The population density of the province based on the 2015 census was 2,300 inhabitants per square kilometre or 6,000 inhabitants per square mile. Among the cities and municipalities in Cavite, the city of Dasmariñas has the biggest population with 659,019 people while the municipality of Gen. Emilio Aguinaldo has registered the smallest population with 22,220 people. Cavite is classified as predominantly urban having 90.69 percent of the population concentrated in the urban areas, while 9.21 percent of the population reside in the rural areas. In line with national statistics, the majority (70%) of the population are Roman Catholic while the strong presence of the Christian Churches such as the mainline Evangelical Churches (UCCP, UNIDA, IEMELIF, Methodist, Baptist and Assemblies Of God), Christian Fellowships (Jesus Is Lord, Bread of Life, Christ's Commission Fellowship, Jesus Is Alive Christian Ministry - Bacoor, Jesus Christ Spreading the Good News) and other Christian Churches such as the United Pentecostal Churches, Seventh-day Adventist and numerous Oneness groups, have increased the population of the other Christian Churches. Iglesia ni Cristo account for 4% of the population and Members Church of God International. While adherents of the Aglipayan Church account for 20% of the total Cavite population. The main languages spoken are Tagalog, Chavacano and English. Due to the province bordering south of Metro Manila, a large number of people from farther provinces migrated to Cavite, resulting in minor but significant usages of Bicolano, Cebuano, Ilocano and Hiligaynon languages. Chavacano or Chabacano is a Spanish-based creole language and known in linguistics as Philippine Creole Spanish. Chabacano is originally spoken by majority of the Caviteños that lived in Cavite City and Ternate after the arrival of the Spaniards three centuries ago. The various dialects of Chabacano were formed out of necessity like all languages, though scholars and laypersons disagree about exactly when and where it all began. The various language groups working at the Cavite naval base needed a way to communicate with each other, and to the soldiers who were barking the orders in less-than-genteel Spanish. It was from this situation that Cavite Chabacano began as a simplified form of Spanish – a pidgin language that later developed into a mixed, or creole language. The fact that the first Chabacanos learned their Spanish from the coarse language of soldiers is probably why they were called Chabacanos in the first place. However, some historians disagree with parts of this story and say that Chabacano did not emerge until almost a century later when Catholic Malays settled in Cavite after the Spaniards had abandoned the Spice Islands to the Dutch in 1662. These Malays, known as the Mardicas (likely from the Malay word merdeka meaning "free" or "independent"), settled in Ternate, the town named after their original homeland. They joined with many other language groups to defend Manila from yet another Chinese warlord, Koxinga (Zheng Chenggong). Now used almost exclusively in Cavite City and coastal Ternate, Chabacano enjoyed its widest diffusion and greatest splendor in Spanish and American period of Filipino history, when newspapers and literary outputs flourished. Cavite Chabacano was spoken with relative ease because it was essentially a simplification of Castillan morphology patterned after the Tagalog syntax. Gradually and naturally, it acquired the sounds present in the Spanish phonological system. After World War II, creole Spanish speakers within the capital of the archipelago vanished. Around 30,000 Caviteños still speak Chabacano, mostly elderly speakers. Aside from the celebrations of town fiestas, the province of Cavite celebrates festivals as forms of thanksgiving for a bountiful harvest. Some of these festivals are also observed in honor of the historical legacies passed from one generation to another generation. In fact, the province fetes the renowned Kalayaan Festival which is given a great social importance in commemoration of the heroism of its people. 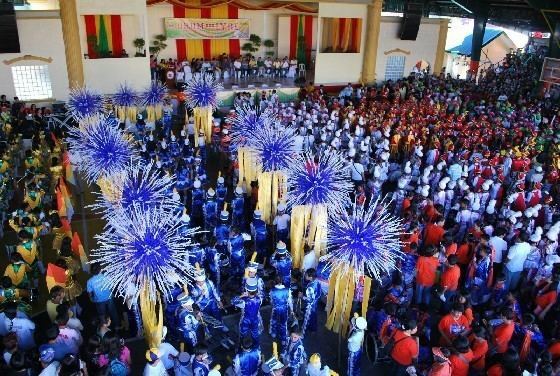 The annual Fiesta de la Reina del Provincia de Cavite is a grandiose fiesta celebration in honor of the patroness of the province, the Nuestra Señora de la Soledad de Porta Vaga. The image is enshrined at San Roque Church in Cavite City. Her feastday is celebrated every 2nd and 3rd Sunday of November. Traditions and fiesta celebrations include Mardicas, a war dance held in Ternate town. Karakol street dancing with a fluvial procession is usually held in coastal towns. There is also a pre-colonial ritual called the Sanghiyang as a form of thanksgiving and to heal the sick. Another cultural tradition is the Live via Crucis or Kalbaryo ni Hesus held during Holy Week. The Maytinis or word prayer that is annually held in Kawit every December 24 before the beginning of the midnight Mass. This is celebrated every March 22 in commemoration of the birth of the First President of the Republic. This is celebrated every June 12 in Kawit as a re-enactment of the historic proclamation of Philippine independence at the mansion of Gen. Emilio Aguinaldo. Cavite is predominantly an agriculture province. Cavite's economy is largely dependent to agriculture. Despite urbanization and industrialization, still, a significant number of Caviteños are engaged into agribusinesses. Data gathered from Office of the Provincial Agriculturist shows that though the province lies in the industrial belt, the agricultural land is about 49.38 percent or 70,466.53 hectares of the total land area of the Province. This is 1,176.5 hectares bigger than that of the declared agricultural lands in 2008 (69,290.03 hectares). The municipality of Maragondon has the biggest area intended for agriculture, accounts for 14.57% of the total provincial agricultural lands while Cavite City has no longer available land for agriculture related activities and industries. If based on total agricultural lands, we may say that the major players in agriculture in the Province are Maragondon, Silang, Indang, Naic and Alfonso. Of the seven districts in the province, the top three with the widest agricultural area are District VII comprising 43,587.01 hectares or 61.85 percent of the total agricultural areas with 27,115 farmers followed by District VI with 17.40 percent or 12,257.71 hectares having 8,701 farmers and District V comprising 10,248.55 hectares with 10,295 farmers. The municipality of Silang has the most number of farmers. The municipality of Maragondon only ranks 3rd in terms of number of farmers. This can be attributed to highly mechanized operation and vast plantation of rice. The same is true with Gen. Trias and Naic, known as the rice producing municipalities in Cavite. The number of farmers increased by 6.5% that corresponds to around 3,097 farmers. The increase in the number of farmers was due to worldwide recession which led to work displacement of some Caviteños. Silang is dominated by pineapple and coffee plantations as well as with cutflower production. Cavite has twelve (12) economic zones. The largest economic zone under development is located in Gen. Trias, the PEC Industrial Park with 177 hectares intended for garments, textiles, semiconductors, food processing and pharmaceuticals. Cavite is a historic, picturesque and scenic province providing a place conducive for both business and leisure. Tagaytay serves as the main tourist center. Historical attraction and sites are Fort San Felipe and Sangley Point, both in Cavite City; Corregidor Island; General Trias; Calero Bridge, Noveleta; Battle of Alapan Marker and Flag in Imus; Zapote Bridge in Bacoor; Battle of Binakayan Monument in Kawit; Tejeros Convention Site in Rosario; and Aguinaldo Shrine, the site of the declaration of Philippine Independence in Kawit. Several old churches stand as glorious reminders of how the Catholic faith has blossomed in the Province of Cavite. Existing museums include Geronimo de los Reyes Museum, General Trias; Museo De La Salle, Dasmariñas; Philippine Navy Museum, Cavite City; Baldomero Aguinaldo Museum, Kawit; and Cavite City Library Museum, Cavite City. There are eight (8) world-class golf courses in the province. Natural wonders are mostly found in the upland areas such as Tagaytay Ridge, Macabag Cave in Maragondon, Balite Falls in Amadeo, Malibiclibic Falls in General Aguinaldo-Magallanes border, Mts. Palay-Palay and Mataas na Gulod National Park in Ternate and Maragondon, Sitio Buhay Unclassified Forest in Magallanes and flowers, vegetables and coffee farms. 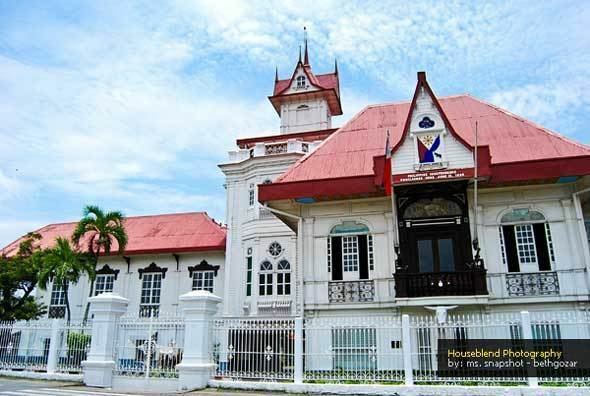 The Aguinaldo Shrine and Museum in Kawit is where the independence of the Philippines was proclaimed on June 12, 1898 by General Aguinaldo, the Philippines’ first president. The Andrés Bonifacio House in General Trias is the former home of the country's revolutionary leader The site of his court martial in Maragondon is also preserved. Other historical sites include the Battle of Alapan and Battle of Julian Bridge Markers, the House of Tirona, and Fort San Felipe. The main churches of the province are the Imus Cathedral, San Roque Parish in Cavite City where the miraculous image of Nuestra Señora de la Soledad de Porta Vaga enshrined., Bacoor, Silang, Naic, Tanza, Ternate, Indang, General Trias, Kawit and Maragondon Catholic Churches. The Shrines of Our Lady of La Salette in Silang, and St. Anne, Tagaytay, also attract pilgrims. Corregidor is an island fortress where Filipino and American forces fought against the Japanese invaders in 1942. It has become a tourist attraction with tunnels, cannons and other war structures still well-preserved. The famous line of General Douglas McArthur said is associated with Corregidor: "I shall return!" There are first class hotels, inns and lodging houses to accommodate both foreign and local tourists. Conference facilities can be found in several convention centers, hotels and resorts in the province. Restaurants and specialty dining places offer mushroom dishes, native delicacies and exotic cuisines. Seafoods, fruits, coffee, organic vegetables, tinapa, handicrafts, ornamental plants also abound in the province. Mountain climbing is also one of the outdoor activities in Cavite. This includes the famous Mount Pico De Loro which is within the towns of Ternate and Maragondon (and some parts of it are already part of Batangas), which is a part of the Palay-Palay and Mataas na Gulod protected landscape. Mt. 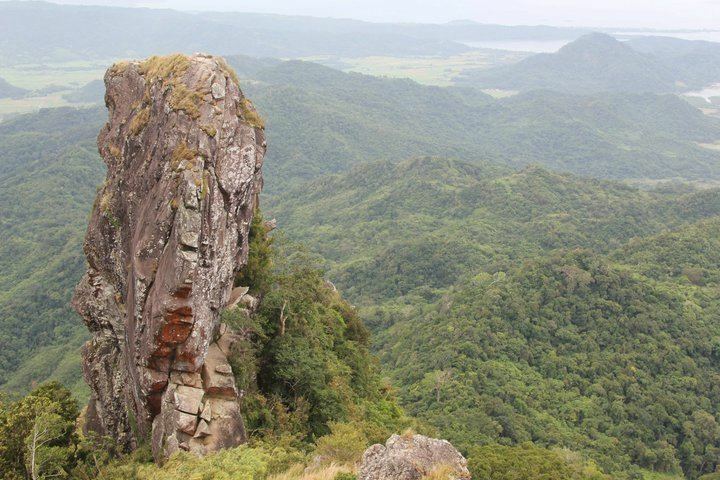 Pico De Loro is the highest part of Cavite at 664 meters above sea level and is noted for its 360 degree view at its summit and a cliff known as Parrot's Beak or Monolith that mountaineers would also like to climb. Mt. Marami, within the same mountain range, located at Magallanes town is also a famous mountaineer location due to its "silyang bato" (en. Chair of rocks) at its summit. There are twenty-two (22) accredited tourism establishments and three (3) accredited tour guides. There are also tour packages being arranged with the Department of Tourism. 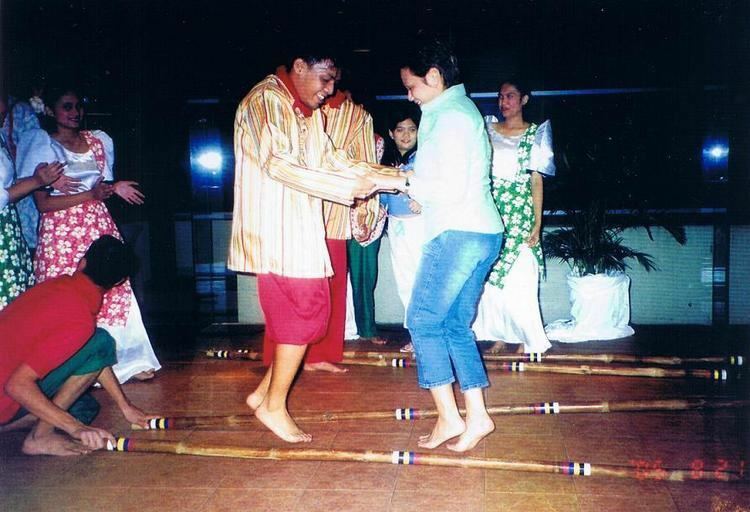 Centuries old traditions and the very rich culture of Cavite have been the source of great pride to Caviteños. In the mid-19th century, Cavite, particularly the Cavite Peninsula in the north, was a stop for ships from South America before free trade opened up. Cavite's total road network comprises roughly 1,973 kilometers (1,226 mi). Of these, the 407.7-kilometre (253.3 mi) national roads are mostly paved with concrete or asphalt and are relatively in good condition with some portions in need of rehabilitation. Provincial roads stretches to an approximate total length of 335.1 kilometers (208.2 mi). Most of these roads are concrete, some are paved with asphalt and the rest remain gravel roads. Majority of the municipal/city roads are paved with concrete, while barangay roads consist of 46.7% concrete and asphalt roads and 53.3% earth and gravel roads. There are three main highways traversing the province: Aguinaldo Highway runs in a general north-south direction; the Governor's Drive runs in a general east-west direction and the A. Soriano Highway runs within the coastal towns on the west. The existing road length computed in terms of road density with respect to population at the standard of 2.4 kilometers per 1,000 population has a deficit of 3,532.71 kilometers. In 2011, the Cavite Expressway (CAVITEX) was opened, which lessened the heavy volume of vehicles on Aguinaldo Highway in Bacoor. This project decreased the traffic congestion in Aguinaldo Highway in Bacoor, so travel time from Imus to Baclaran/Pasay is lessened to only one hour. In 2013, the Kaybiang Tunnel, the country's longest underground highway tunnel at 300 meters was opened along the Ternate-Nasugbu Road piercing through Mt. Pico De Loro's north ridge, tunnels'drainage system are designed thru this link, that shortens the travel time from Manila to the western coves of Cavite and Nasugbu, Batangas. Last July 24, 2015, the Muntinlupa–Cavite Expressway, a 4 km (2 mi) (2.5 mi) long access-controlled toll expressway linking the southern province of Cavite to Muntinlupa in the Philippines, was opened to the public. The road is expected to reduce travel time by an average of 45 minutes from Daang Hari to Alabang Interchange as well as decongest traffic in Cavite, Las Piñas and Muntinlupa. Currently, Cavite province is served by three DPWH offices: Cavite I District (serving legislative district 1, 3 and 6), Cavite II District (corresponding to the seventh legislative district) and Cavite Sub-district (serves legislative districts 2, 4 and 5). The Cavite–Laguna Expressway (CALAX) is a under-construction expressway that will cross the provinces of Cavite and Laguna in the Philippines. The construction of the four-lane 47-kilometre-long (29 mi) expressway will connect CAVITEX in Kawit, Cavite to SLEX-Mamplasan Interchange. When constructed, it is expected to ease the traffic in the Cavite–Laguna region, particularly in Aguinaldo Highway, Sta. Rosa-Tagaytay Road and Governor's Drive. Cavite-Tagaytay-Batangas Expressway is also a proposed expressway connects with CALAx from Silang, Cavite to Nasugbu, Batangas. CTBEx is a future alternative route for tourists going to Tagaytay and Nasugbu. The LRT Line 1 South Extension Project, through southern Metro Manila to the Province of Cavite has been identified as an integral link of the Rail Transit Network by Metro Manila Urban Transportation Integration Study (MMUTIS). It is one of the priority projects of the Department of Transportation and Communications (DOTC) and LRTA. It is also a flagship project of the Office of the President. The project aims to expand the existing LRT Line 1 service southward to the cities of Parañaque, Las Piñas and the city of Bacoor in the Cavite Province. The 11.7-km route of the light railway system that will start from Baclaran to Niog was planned to carry a capacity of 40,000 passengers per direction per hour. The extension will have 48 air-conditioned coaches, 12-four car trains, 8 passenger stations and a satellite depot in Cavite. The construction begins because the groundbreaking of LRT Line 1 South Extension Project was held on Thursday, May 4, 2017. The LRT Line 1 South Extension Project will be done in phases. Once the phase 2 is completed, Cavite will be served by the LRT-1 (via Niog Station). This is the second project outside Metro Manila after the planned MRT-7 that starts from North Avenue, Quezon City and it will end in San Jose Del Monte, Bulacan. The said project will serve approximately 1.9 million commuters based in Pasay, Paranaque, Las Piñas and Bacoor. The proposed LRT Line 6 project would further extend the LRT system by another 19 kilometers all the way to Dasmariñas from the proposed end in Niog Station in Bacoor, Cavite. The mass transit system would pass along the Aguinaldo Highway and would have stations in Niog, Tirona Station, Imus Station, Daang Hari Station, Salitran Station, Congressional Avenue Station, and Governor's Drive Station. The project will improve passenger mobility and reduce the volume of vehicular traffic in the Cavite area by providing a higher capacity mass transit system. It also aims to spur economic development along the extension corridor. There is one ferry service: Metrostar Ferry, from Cavite City to SM Mall of Asia in Pasay. Note: Partido Magdalo is a local political party in Cavite which is a coalition of Nacionalista Party, Lakas-CMD (LAKAS), United Nationalist Alliance (UNA), Pwersa ng Masang Pilipino, Nationalist Peoples Coalition (NPC) and National Unity Party (NUP) (with the 4th district being an exemption since its representatives caucuses with the Liberal).